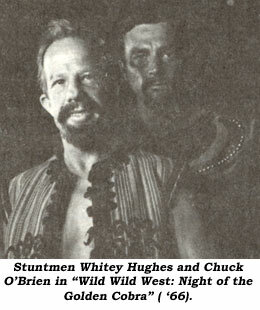 We lost Whitey Hughes, one of the best stuntmen I’ve ever known, July 7. He died in his sleep at 88 in Somerton, AZ. Whitey was born Nov. 9, 1920, in Arkoma, OK, on the Arkansas/Oklahoma border, near Ft. Smith. Whitey was raised on a farm where he learned to plow and drive teams as well as ride and break horses with his Dad. The family moved to California in ‘36 when Whitey was just 16 years old. He graduated from Fremont High School in L. A. Already an accomplished livestock teamster because of his farm upbringing, Whitey found his way into the film business in 1947 as a full fledged Screen Actors Guild member. From ‘48 through ‘53 Whitey worked for Robert Gilbert Productions as a stuntman and double for such stars as Reno Browne and Lee “Lasses” White in “Red Rock Outlaw” (‘50). At the same time Whitey was doing loads of stunts on Johnny Carpenter’s low budget westerns like “Badman’s Gold” (‘51) and “Son of a Renegade” (‘53). Whitey recalls his first location job was in Lone Pine, doubling leading lady, Lynne Roberts in Tim Holt’s “Dynamite Pass” (‘50). 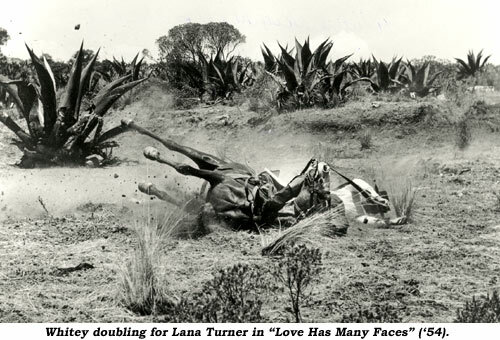 Whitey was often called upon to double for women in these early days and would eventually do stunts for such luminaries as Rita Hayworth, Stephanie Powers, Barbara Hershey, Anne Baxter, Lana Turner, Kathleen Crowley and Virginia Mayo (“Along the Great Divide”, again on location in Lone Pine). 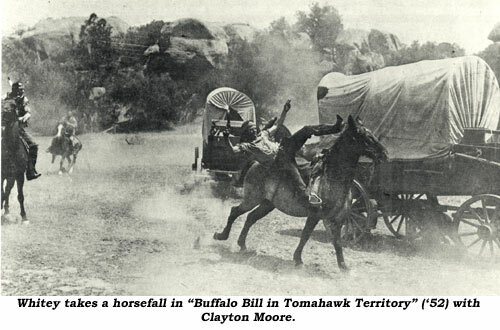 Whitey’s credits include work on “The Wild One” with Marlon Brando, “Sitting Bull” with Dale Robertson, “Darby O’Gill and the Little People”, “Charge at Feather River” with Guy Madison, “Geronimo” with Chuck Connors and Sam Peckinpah’s “Wild Bunch”. Whitey was Johnny Crawford’s double for four years on TV’s “Rifleman” as well as Bobby Diamond’s double during the run of the “Fury” TV series. Whitey also worked on “U.S. Marshal”, “Californians”, “MacKenzie’s Raiders”, “Black Saddle”, “Wyatt Earp”, “Lassie”, “Rawhide”, “Bonanza”, “Monroes”, “Hondo”, “Gunsmoke”…and hundreds more including work for both Roy and Gene on their respective series. His multitude of work is only highlighted in this article. 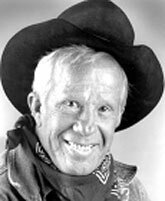 For terrific stunt viewing, I recommend watching Whitey in action in almost every episode of “The Wild Wild West”, which he coordinated for four seasons (‘65-‘68). Whitey and his stunt crew do some amazing action sequences. Whitey spent ‘70-‘71 preparing his own production, “Smoke In the Wind”, which, sadly, was not well distributed. 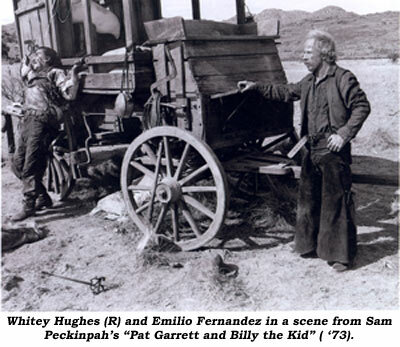 It starred John Russell, Walter Brennan and John Ashley. When western work petered out in the ‘70s, Whitey worked on series and films such as “Omega Man”, “Harper Valley P.T.A.”, “Spiderman”, “Wonder Woman”, “B. J. and the Bear”, “Buck Rogers”, “Father Murphy”, “Fall Guy”, “Blue and the Gray”, “Little House on the Prairie” and many others. An active stuntman for over 50 years Whitey was even prouder of his 70 year marriage to his lovely wife, Dotti. Whenever you had the pleasure of meeting Whitey and Dotti, you met one of the greatest stuntmen ever to perform for the cameras, and secondly, you met two of the finest, most upbeat people it was my pleasure to know.